Jermaine Anderson's third goal in three games secured a nervy, but deserved win for Peterborough over Fleetwood. Posh missed numerous chances in the first half, with Conor Washington blazing over while Joe Davis' long-range effort hit the bar for Fleetwood. Within seconds of coming on, substitute Souleymane Coulibaly's first touch of the game eventually broke the deadlock. Another sub, David Ball, then equalised for the visitors before Anderson's header sealed Peterborough's victory. Match ends, Peterborough United 2, Fleetwood Town 1. Second Half ends, Peterborough United 2, Fleetwood Town 1. Corner, Fleetwood Town. Conceded by Ben Alnwick. Attempt saved. Antoni Sarcevic (Fleetwood Town) right footed shot from long range on the right is saved in the centre of the goal. Attempt missed. Nathan Pond (Fleetwood Town) right footed shot from outside the box is too high. Corner, Fleetwood Town. Conceded by Ricardo Santos. 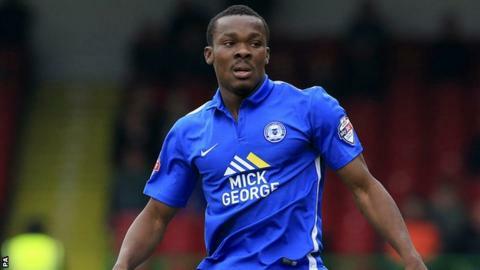 Souleymane Coulibaly (Peterborough United) is shown the yellow card for a bad foul. Corner, Fleetwood Town. Conceded by Jermaine Anderson. Attempt blocked. David Ball (Fleetwood Town) right footed shot from the left side of the box is blocked. Foul by David Henen (Fleetwood Town). Attempt missed. Marcus Maddison (Peterborough United) left footed shot from the centre of the box is close, but misses to the right. Substitution, Peterborough United. Andrew Fox replaces Conor Washington. David Henen (Fleetwood Town) hits the bar with a right footed shot from the left side of the box. Attempt saved. Jimmy Ryan (Fleetwood Town) right footed shot from a difficult angle and long range on the left is saved in the centre of the goal. Goal! Peterborough United 2, Fleetwood Town 1. Jermaine Anderson (Peterborough United) header from the centre of the box to the centre of the goal. Assisted by Michael Smith with a cross. Corner, Peterborough United. Conceded by Chris Maxwell. Attempt saved. Jon Taylor (Peterborough United) right footed shot from outside the box is saved in the top centre of the goal. Attempt missed. Conor Washington (Peterborough United) right footed shot from outside the box misses to the right. Corner, Peterborough United. Conceded by Joe Davis.